Since I spotted a few Falkbeer Counter Gambits during my trawl through TL Openings, I thought I'd try it out some time. 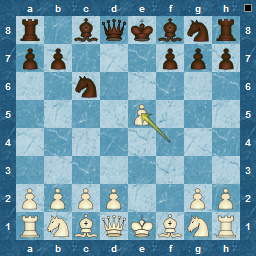 I had the opportunity recently, as recent blitz opponents seemed to play the King's Gambit a couple of times. 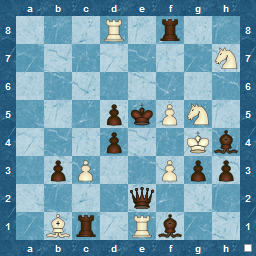 After losing a couple of times, I did some minimal research, and found a couple of ways to play it, ending up deciding to try c6, the Nimzowitsch counter gambit. My next use of it was wonderful, though thanks in no small part to my opponent's mistakes. 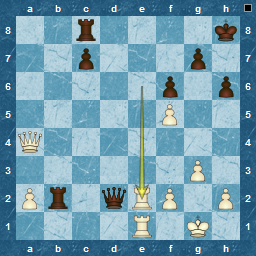 Here capturing the e-pawn is a major mistake, as it allows Qh4+. A second major mistakes was 6. Ke2. Of course, 6.g3 isn't that good either, but isn't so terminal. Here Qg6 is a forced win. I actually played Qxe5+, which also wins , but takes longer. Overall, an enjoyable experience, but I doubt I would play it outside of blitz ! I need to look back at some of my games in TL, as I haven't spent time on them in any way,and so as a prelude to that, I thought I'd put out another "TL Openings' post to cover TL55, as a way to start the process for me. Personally, my record was +2=3-2, that's 50%. Par for the course, although if you take out my default win and draw ( as you should ) , I have a not great 40%, and only 1 win out of 5 played games : GM material I am not ! Definitely room for improvement, although I would have to say generally not in the area of openings. 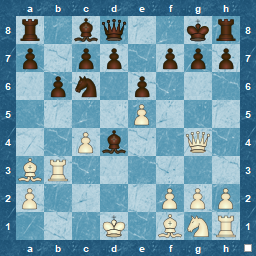 Here, I tend to do well, mostly coming out into the middlegame with a good position. Its there, that I lose it ! The French, where, as usual, I avoided mainline French lines with the fun-filled Réti Gambit. 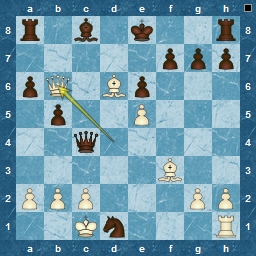 Certainly, I reached an acceptable middlegame, but let things slip with a simple oversight losing a pawn. Following this with a less than active defence meant I played a pawn down for 20 moves, and eventually blundered a piece. I held ground for quite some time, but ultimately couldn't hold of the attack. I really don't like the French. The Sicilian ( sounds like a Gothic novel title ! ). This was a different prospect, as I think it was the first time I switched to a main line, rather my usual 2.b3 ( the so-called Czerniak Attack ). 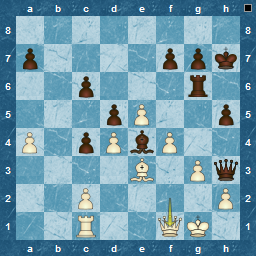 Guided by Timothy Taylor ( in spirit, not in person :) , I played a Classical line with Be2, and again found myself well-placed in the middlegame, helped, I am sure, by an indecisive Black Qb6, followed by a creeping Qd8 retreat. 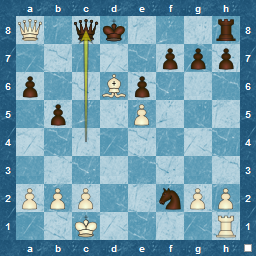 I don't think he was ready or could calculate the positions after Qxb2, but no shame there ! In the end a forced combination led to a loss of a piece and an inevitable resignation : always satisfying to defeat the Sicilian. As Black, I started with a loss in a Philidor. Again, I came out of the opening well, and then spent a long time until I made a major mistake. I even had a great chance to recover, but didn't see it, ending up a long piece down and resigning. Twice I had games in the Old Indian/King's Indian, drawing both, which was a good feeling , as I don't consider myself a d4 player. 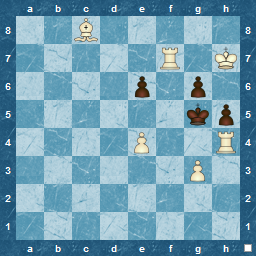 I'd say I was well-prepared in both of them, with a more than acceptable middlegame. In both, I gained the upper hand, but didn't see a plan to win, and with a lack of time my draw offers were accepted. Definitely could do better here. How does my opening experience compare to Team League overall ? 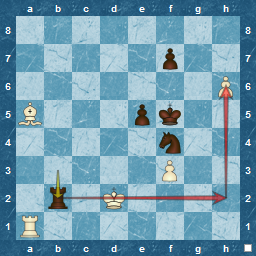 The Black King is practically in mate, and if the Queen was out of the way, f4 would deliver it. So, the solution is to remove the Queen with Rxe2 ? 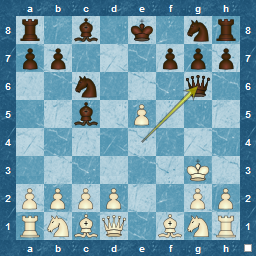 Well, no In practical terms, ie in a game, that will work, although mate will take longer. To solve in two, its simply Be4. No matter what Black plays, a mate can be delivered. A relatively straightforward Mate in 2, courtesy of Mr RB Wormald. The New Year seems to have flown by, and good intentions, well, not quite fulfilled. 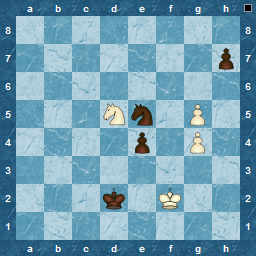 Below, White has played what should be the losing move, in Qf2 - f1. Luckily for him, Black didn't play the sharp move, and a draw was agreed in a few moves. Here you go...a problem from 1867, courtesy of a Mr W. Greenwood.